Even if you are in love with sushi, it doesn't make much sense to pay several visits to a restaurant to enjoy it. It may turn to be an extremely expensive endeavor, but the good thing is that you can learn how to make sushi rolls at home. 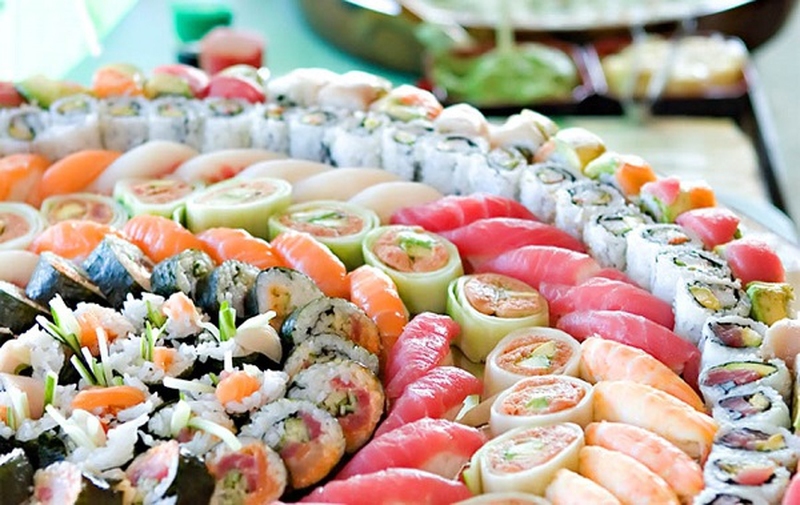 Once you master it, you will no longer need to spend so much money to enjoy sushi. Read on to learn what you have to do to cook like a seasoned sushi chef. It is possible to make California sushi rolls only when you have some knowledge about making a basic inside out roll. It is a great recipe for you if you do not care much about raw fish. Here is what you need to make 12 sushi rolls. Use a plastic wrap to wrap the bamboo mat and then break a nori sheet in half. Toast it for a few seconds if you find it difficult to break. Take the half of the sheet and place it on the mat, keeping the shiny side facing down. Spread some prepared sushi rice over the nori sheet and do not press it down onto the sheet. Be sure to cover the entire sheet. Take sesame seeds or Masago and sprinkle it over the rice. Flip the sheet gently to keep the rice facing down. Get the crab sticks and line them up at the end of the sheet, and then place 1-2 thick slices of avocados next to the crab sticks. Roll it and cut into 8 equal pieces. Cut it in half first and then into smaller pieces. Serve it with pickled ginger, soy sauce and wasabi! Maki sushi refers to all types of rolled sushi. The hosomaki is up to 2 ½ cm in diameter with one filling. The chumaki is basically a medium-sized roll with about 3.8cm of diameter and a couple of fillings. Futomaki is 5-6cm in diameter containing 4 or more fillings. Here is info to learn how make sushi rolls, like Futomaki, at home. How to make sushi rolls, especially those with rich flavors? Here is the detailed instruction about making Futomaki to enrich your diet. Take a small bowl and wash kanpyo in it. Rinse well and drain. Soak in fresh water for an hour. Get it out and give it a nice squeeze to get rid of excess water. Now, cut it into 8-inch-long pieces. Take a medium pot, and combine and boil soy sauce, dashi soup stock, mirin, and sugar in it. Add kanpyp and simmer on low heat. Keep heating until there is little liquid left. Leave it to cool down a bit. Get a small bowl and beat sugar and egg in it. Heat canola oil in a pan and coat it well. Now, introduce the egg mixture to the pan and create a thin layer. Slowly roll the egg omelet until it turns into a thick rolled omelet. Take it out of the pan and leave for a few minutes. Finish by cutting it into long sticks. Start by wrapping the bamboo mat with a plastic wrap. Take a large nori sheet and place it over the bamboo mat. Take a quarter portion of sushi rice and spread it over the sheet evenly. Place omelet, kanpyo and cucumber sticks on the center of the rice and roll. Turn it into a cylindrical shape and then remove the mat from the sushi. Leave it for a while. Make three more rolls following the same procedure and cut them into bite-size pieces to serve. Ensure that your hands are dry – this helps ensure that the seaweed is tasty and crunchy. With shiny side down, place the nori sheet or seaweed on the palm of your hand. Apply some water on your other hand and spread the layer of rice on one-half of the sheet. Get some sesame seeds and sprinkle onto the rice to enhance its taste. Place a piece of raw fish right in the middle of the rice and then a piece of your selected vegetable right next to it. You can opt for cucumber, avocado, tofu, egg, or even picked radish. Bend your hand a bit to roll the temaki. Gently fold its end, tuck it in, and roll it into a cone shape. Use one kernel of rice to keep the cone together – simply squash the rice into the corner.